Another set of Jazz Notes rolls off the line. The first thing to say is that Lollo Meier and his band were absolutely superb. Lollo is from Holland and one of the finest exponents of Django style jazz anywhere. Filippo and Umberto (Rhythm guitar and bass) are both from Italy and clarinettist Andre from Belgium and they produced some exquisite music including many original tunes by Lollo himself. If they come this way again, we shall do our best to include them in our programme. Let’s hope they do. 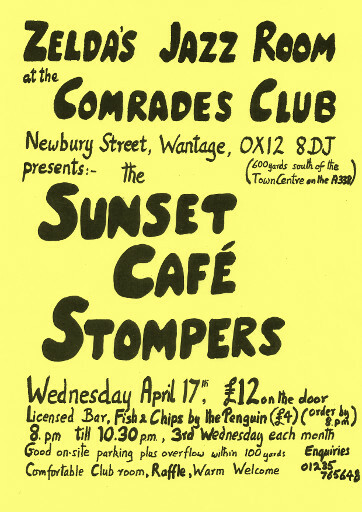 In April we present one of the very best classic jazz bands, the Sunset Café Stompers led and organised by pianist Mike Denham and including that fine cornet player Steve Graham. Their program is always full of lovely tunes from the New Orleans era, played with verve and swing and lots of attention to detail. A super band. At the Lamb we were delighted to feature Lizzie Newbery again. She is such an enthusiastic performer with a great taste in songs. The Rascals love working with her and we always have a lot of fun. We hope that comes across to you. 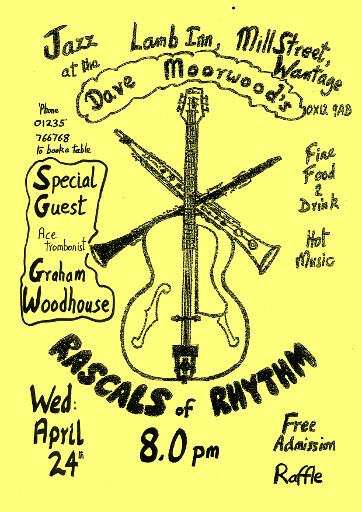 April’s guest will be a fine trombone player from the Nottingham area, Graham Woodhouse. I first met him playing with Pete Allen where I much admired his sound and attack and original thinking. It’s been some time since his first visit so we look forward to his unique way of adding him to the Rascals music again. Do come to hear him and give him a warm welcome. On Sunday April 21st I will be with Pete Allen at the Chequers in Newbury at 3pm. Pete has invited American vocalist Susan Valliant Speer to sing with the band so that will be another very entertaining session. I shan’t be involved with Graeme Hewitt’s band at Theale anymore so won’t be able to report what is happening there. After a considerable “difference of opinion” he decided to dispense with all the rhythm section except drummer Steve Watling. The sessions will continue and have been much enjoyed by many of you, we hope you can go on doing so. For me it’s the end of a 25-year engagement (for pianist Perry Lock 30 years!). Ah well, you can’t win them all, though we shall miss playing for you. That’s it for now – Keep enjoying the Jazz – we look forward to seeing you!